She couldn't be any better suited for the job. Nanny Bear is pudgy enough to love, but quick enough to tweak the mischief out of evening tumbles on the lawn. She listens raptly to the rambling daydreams of childhood, yet plays the perfect bystander to to games to which we adults are no longer privy. Like a good friend, Nanny Bear has those elusive qualities that make it easier to introduce her than to describe her, so she is bound to be invited out as much as in, and to be found wherever the little ones congregate. 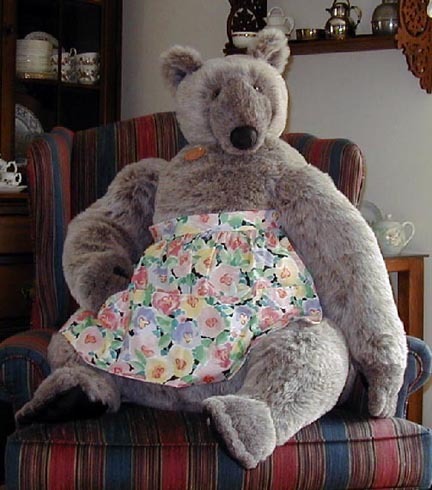 No matter what the conditions in your household, Nanny Bear can be counted on to wear the apron - a nice cotton one, complete with pockets for safekeeping secrets and, more important on some days than others, strings for clinging to. Other Pivoting head, Dangling arms, Cotton apron with assorted small toys.